The Lancer sedan was an instant hit. But what about now, seven years later? All of its rivals have been updated, while the Lancer has continued along its merry way without any major changes. SPOILER ALERT, the answer is: “No.” The Lancer is no longer up to snuff. We recently got reacquainted with this old friend and it was like travelling back in time. Don’t get the wrong idea—Mitsubishi’s sedan is just as good as it was when it was unveiled. In fact, it has actually gotten better with age. However, while it has kept its muscular grille and square lines, the other models in the category have adopted less generic exteriors with wavier and more “organic” lines (as the press releases from the various manufacturers are fond of saying, without ever really specifying what “organic” means). Father Time has been most unkind to the passenger compartment. The design with buttons that look like they were chopped with an axe and large flat surfaces just doesn’t pass muster any more. Fortunately, there’s an aluminum strip that runs from one end of the dashboard to the other and adds a little life to an otherwise dark grey, very dark grey, charcoal grey and iron grey environment. The various controls are ergonomically sound and the front seats offer decent comfort, at least for short- to medium-length trips. I didn’t have the chance to drive it for several consecutive hours to see how it fared on a longer trip. Despite the Rockford Fosgate system’s immense subwoofer housed in the left inner fender that eats up several litres in the trunk, there’s still good cargo capacity. The spoiler located on top of the trunk is easy on the eyes, but weighs the lid down, causing it to close on its own at any moment. Imagine what it’s like in winter covered in snow and ice, too. Under the hood of the GT AWC that we tested, there was a 2.4-litre four-cylinder that develops 168 horsepower at 6,000 rpm for a torque of 167 lbs.-ft. at 4,100 rpm. This is relatively good output for the category and it’s hard to believe that the EVO version can be equipped with nearly 300 horsepower. The base trims get a rather paltry 2.0-litre 148-horsepower engine that produces 145 lbs.-ft. of torque. Judging by the sound made by the 2.4 during acceleration, we feel sorry for 2.0-litre owners’ ears. Our test car was equipped with a CVT, the only transmission offered with all-wheel drive. They work quite well together, although it’s far from refined. The GT AWC doesn’t have nearly the oomph of the sportier Ralliart and EVO versions. In any case, fuel consumption, which is likely to be important to Lancer GT AWC buyers, is no more impressive than the refinement of the drivetrain. After a weeklong test drive, our average fuel consumption was 9.1 L/100 km according to our manual calculations, to which we had to resort since the on-board computer had the infuriating habit of resetting to zero practically every time we started the engine. These numbers wouldn’t have seemed so bad if, a few weeks later, I hadn’t test driven a much more powerful Subaru WRX (268 horsepower and 258 lbs.-ft. of torque) equipped with an infinitely more pleasant CVT and a very dynamic all-wheel drive system that used an average of 8.9 litres fuel. The all-wheel drive system is quite good and no one can deny that during a snow storm, you’ll really appreciate it, especially considering that it can be locked so that the torque is distributed equally between the front and rear wheels, thus improving traction. It’s also possible to drive solely in front-wheel drive mode. The hydraulic power steering is relatively precise but when it’s turned abruptly, it brings out some body roll. The handling is very solid thanks to a still up-to-date chassis that can easily deal with the far superior power and torque of the Ralliart and EVO. 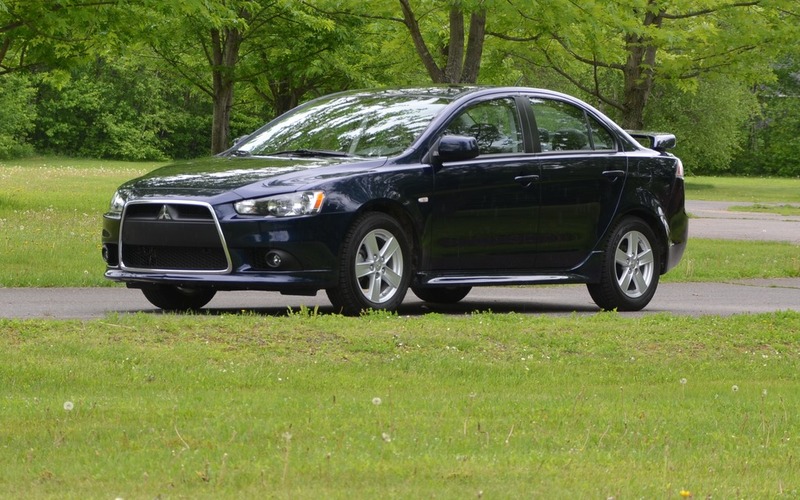 If you’re looking for the latest model on the market, the Lancer is not for you. Then again, if you want a good car to get you from A to B year after year and the quality of the interior and plastics (not to mention the dark grey, very dark grey, charcoal and iron grey tones) aren’t important to you, the Lancer may be what you’re looking for. But be forewarned: its fuel consumption is higher than some of its rivals. 7/10	Good resale value and proven reliability. 8/10	4 stars for the bodywork, 1.5 for the interior. 7/10	Suspension is firm, but the seats are comfortable. 7/10	If you like to keep your cars for a long time and don't mind a dated design, the Lancer might be a good deal!